my handcrafted home: Finally free from medicine cupboard attack! 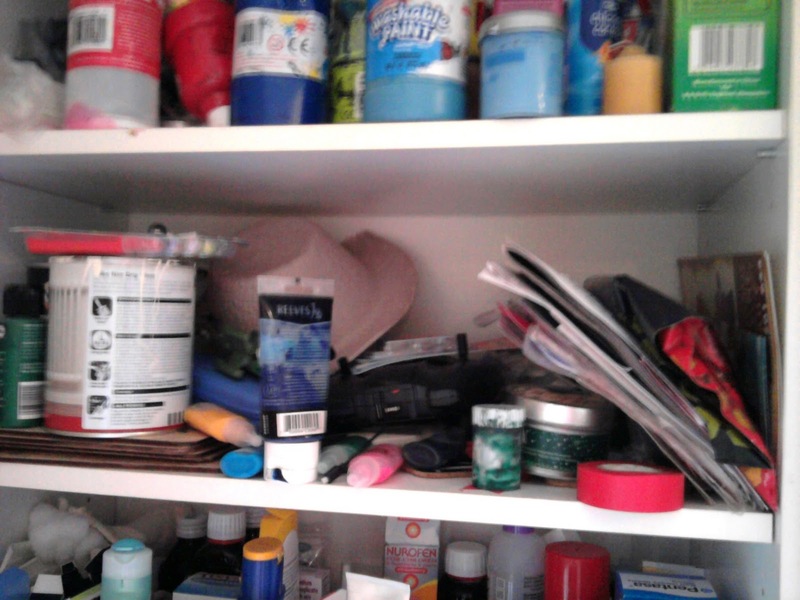 Tell me you have the same problem with one of your cupboards? You open it and bam! The cupboard contents come crashing down? Although my kids think it's pretty funny, I decided it was probably a sign I needed to de-junk in there. 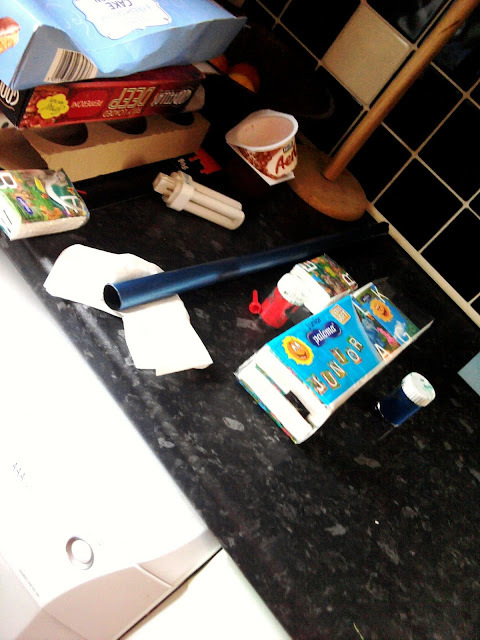 Though the metal tube is actually from some over zealous brushing (poor sweeping brush) and is waiting for the recycle bin, as is the paper pile to the left! Clearly everywhere needs de-junking! Anyway, here's some scary before pictures taken on my phone, so sorry for the quality, though it does make the afters seem even better! I am constantly having to find things for my husband, who, when I tell him an item is in a location and it is not in front of his eyes immediately he believes it is not there. I mean the result is that he thinks I'm awesome at finding things, which is nice, but I would prefer not to be interrupted every five minutes as he's preparing to leave for golf and I'm getting both kids ready...not that this has solved that but at least it will make a few things easier, plus no medicine attacks! 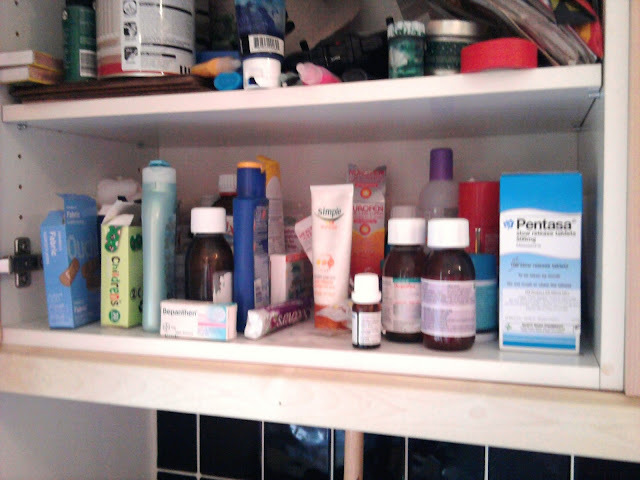 Here's one of the medicine shelf before. Try not to judge us on our huge quantity here. And the middle 'miscellaneous' shelf before. On the top shelf I found a surprisingly large store of light bulbs. I guess because we were married before everything was energy saving we went through them quicker and bought a few to go with every light. Anyway I put them into our old fruit bowl - and hid those things that you have little idea what they are or what you need them for but don't want to bin in case they become essential one day, in the bottom. I sorted the kids paints and my fabric paints to the other side and stacked the place mats and heat pads to the right (we don't use them every day). I used some old boxes that were destined for the recycling pile for candles on the right and curtain hooks and those child safe locks for cupboards in the middle one. I'll cover them in some pretty paper once I've lived with it a couple of weeks and decided that those are what I want in there. 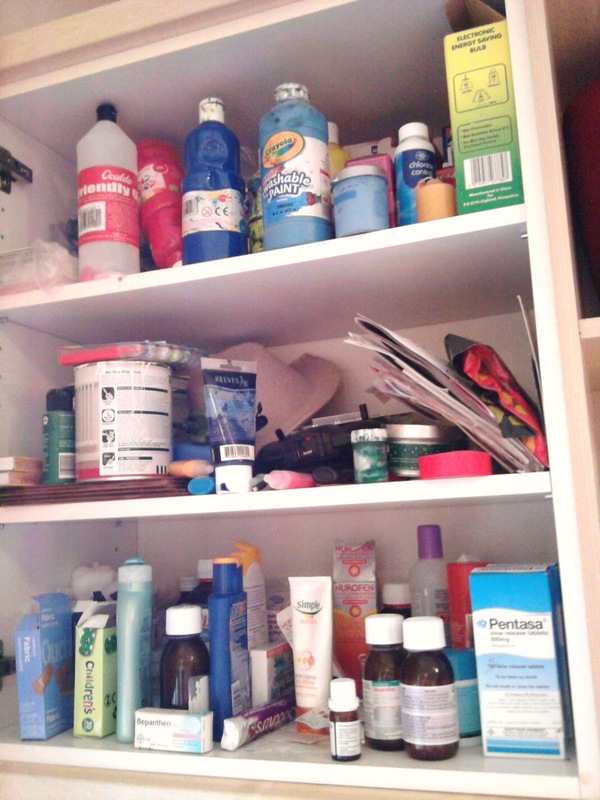 On this bottom shelf I put all the kids medicines to one side separated by the plasters and bandages in a little box. Then we have an idea of where to look in the middle of the night when a child has a temperature and we're still half asleep. Opposed to how it was where we'd knock over every bottle to get to that back one we need. And I know that this is a lot of photos for a cupboard, but it really does make me happy, and my life that little bit easier. Plus I love that I spent no money, just used a couple of things I already had and some empty boxes. 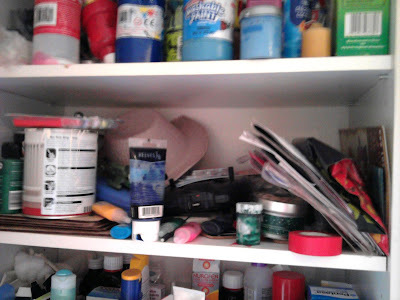 I have totally been inspired by this blog, I heart organizing, written by Jen. She has an amazing home! And her storage solutions are never too pricey and she reuses things from around her home. And seriously, doing this has made me want this kind of prettiness and tidiness all around my home, so be prepared for some more organisation soon. And since I'm a little obsessed with this right now I'd love to know if you've been doing anything like this? Especially with Christmas approaching. And cheap resourceful ideas you've come up with? I'm going to do a special organised and pretty One Day Monday next week, and i'd love it if I could share some of my readers projects, ideas or tips.